5 Surface Drainage Theory – Welcome to the OptiSurface Support Center! During rain or irrigation, the fields become wet. The water infiltrates into the soil and is stored in its pores. 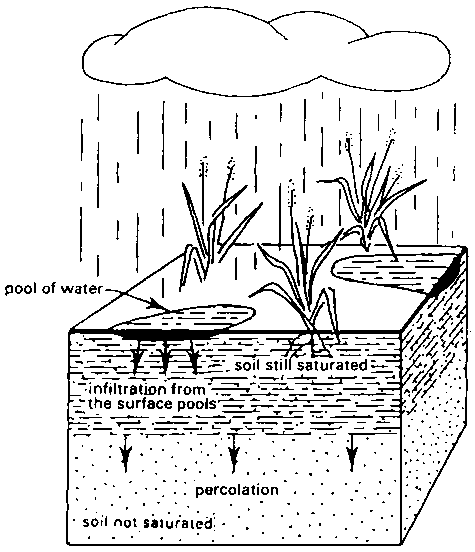 When all the pores are filled with water, the soil is said to be saturated and no more water can be absorbed; when rain or irrigation continues, pools may form on the soil surface (Figure 1). Figure 1. During heavy rainfall the upper soil layers become saturated and pools may form. Water percolates to deeper layers and infiltrates from the pools. Part of the water present in the saturated upper soil layers flows downward into deeper layers and is replaced by water infiltrating from the surface pools. When there is no more water left on the soil surface, the downward flow continues for a while and air re-enters in the pores of the soil. This soil is not saturated anymore. However, saturation may have lasted too long for the plants' health. Plant roots require air as well as water and most plants cannot withstand saturated soil for long periods (rice is an exception). Besides damage to the crop, a very wet soil makes the use of machinery difficult, if not impossible. Excessive surface water ponding can also lead to increased recharge of the groundwater reservoir. 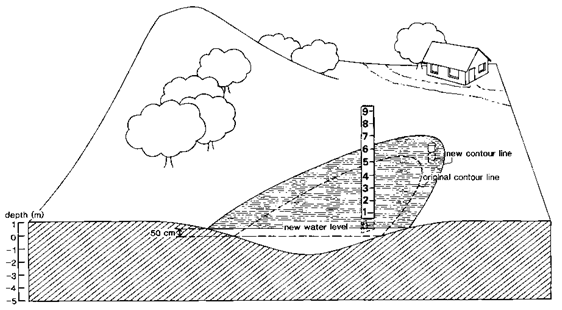 As a result, the groundwater level (often called groundwater table or simply water table) rises. This can lead to further water logging and soil salinisation. A drainage system is often necessary to remove excess water from the agricultural land. This excess water may be from irrigation or surface runoff from rainfall. It may also include leakage or seepage water from the distribution system. Surface drainage which is removal of excess water from the ground surface. This can be achieved through landforming and/or shallow open drains. Subsurface drainage which is the removal of excess water from the below the ground surface. This can be achieved through deep open drains or underground pipes. Optisurface Landforming focuses on surface drainage through landforming and tries to minimise the need for shallow open drains so that fields can be larger and uninterrupted for better land utilisation and machine efficiency. A slope is the rise or fall of the land surface. 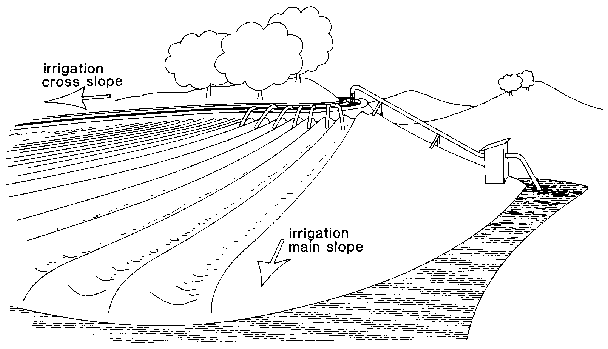 It is important for the farmer or irrigator to identify the slopes on the land. A slope is easy to recognize in a hilly area. Start climbing from the foot of a hill toward the top, this is called a rising slope (see Fig. 2, black arrow). Go downhill, this is a falling slope (see Fig. 2, white arrow). Flat areas are never strictly horizontal; there are gentle slopes in a seemingly flat area, but they are often hardly noticeable to the naked eye. An accurate survey of the land is necessary to identify these so called "flat slopes". An example is given in Fig. 3. What is the slope in percent of a field with a horizontal length of 200 m and a height difference of 1.5 m between the top and the bottom? What is the difference in height between the top and the bottom of a field when the horizontal length of the field is 300 m and the slope is 2%. 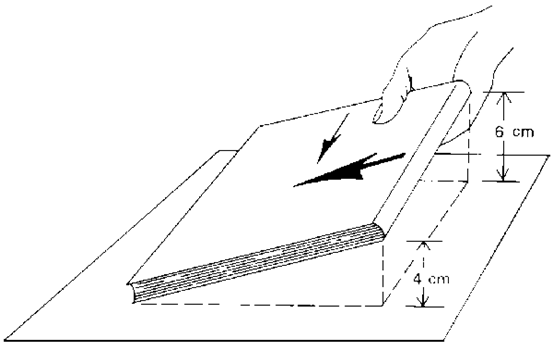 height difference (m) = 2/100 x 300 m = 6 m.
Place a book on a table and lift one side of it 4 centimetres from the table (Fig. 4). 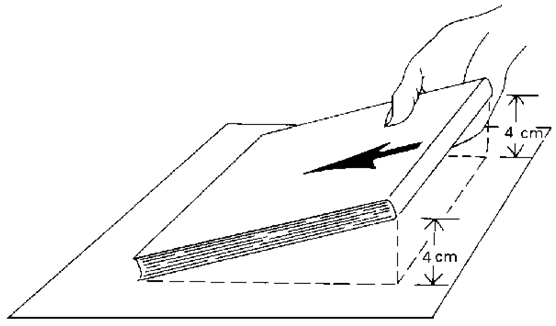 Now, tilt the book sideways (6 cm) so that only one corner of it touches the table (Fig. 5). The thick arrow indicates the direction of what can be called the main slope; the thin arrow indicates the direction of the cross slope, the latter crosses the direction of the main slope. 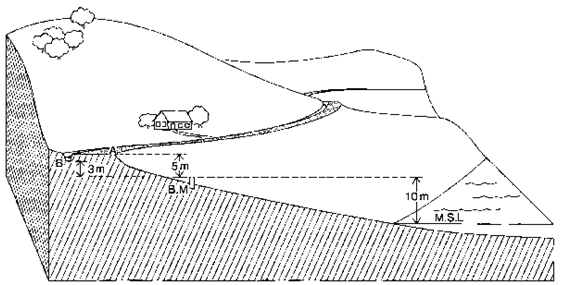 An illustration of the main slope and the cross slope of an irrigated field is shown in Fig. 6. In Figure 7, point A is at the top of a concrete bridge. Any other point in the surrounding area is higher or lower than A, and the vertical distance between the two can be determined. For example, B is higher than A, and the vertical distance between A and B is 2 m. Point C, is lower than A and the vertical distance between A and C is 1 m. If point A is chosen as a reference point or datum, the elevation of any other point in the field can be defined as the vertical distance between this point and A. Figure 7. Reference point or datum "A"
Thus, the height or elevation of B, in relation to the datum A, is 2 m and the elevation of C, also related to the datum A, is 1 m.
As a reminder that a point is above or below the datum, its elevation is prefixed by the sign + (plus) if it is above the datum, or - (minus) if it is below the datum. Therefore, in relation to the datum A, the elevation of B is +2 m and the elevation of C is -1 m.
A bench mark is a permanent mark established in a field to use as a reference point. A bench mark can be a concrete base in which an iron bar is fixed, indicating the exact place of the reference point. A bench mark can also be a permanent object on the farm, such as the top of a concrete structure. All bench mark heights are given in relationship to the one datum plane which can be mean sea level (MSL) (see Fig. 52) or some arbitrary datum defined for some other purpose. In Figure 8, the elevation of point A in relation to the bench mark (BM) is 5 metres. 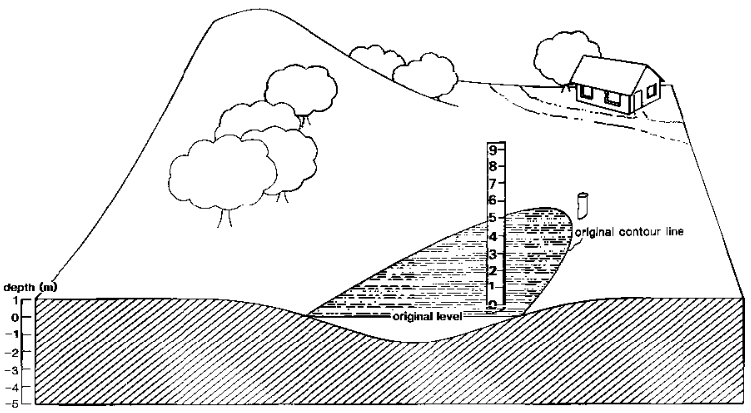 The BM elevation relative to the mean sea level (MSL) is 10 m. Thus, the elevation of point A relative to the MSL is 5 m + 10 m = 15 m and is called the reduced level (RL) of A. What is the reduced level of point B in Figure 8. What is the difference in elevation between A and B? What does it represent? The difference in elevation between A and B is the reduced level of A minus the reduced level of B = 15 m - 13 m = 2 m, which represents the vertical distance between A and B. A contour line is the imaginary horizontal line that connects all points in a field which have the same elevation. A contour line is imaginary but can be visualized by taking the example of a lake. The water level of a lake may move up and down, but the water surface always remains horizontal. The level of the water on the shore line of the lake makes a contour line because it reaches points which are all at the same elevation (Fig. 9). Suppose the water level of the lake rises 50 cm above its original level. The contour line, formed by the shore line, changes and takes a new shape, now joining all the points 50 cm higher than the original lake level (Fig. 10). Contour lines are useful means to illustrate the topography of a field on a flat map; the height of each contour line is indicated on the map so that the hills or depressions can be identified.